Cat Chat With Caren And Cody: Cinco de Mayo!!!! Have a great day...sing and dance and enjoy some yummy noms to catabrate! Do it for us, too...meowmy has to go to work...she just had nine days of vacation...now its back to regular doings, whatevfur that means! Cody you look ready to ROCK on Cinco de Mayo! Happy Cinco de Mayo, Cody! You look like you're ready for a big party! Hola, Cody! Feliz Cinco de Mayo! Happy Cinco de Mayo, Cody! Feliz Cinco de Mayo...me casa or yours? We are celebrating on our blog too...cat bro Bert...maybe a bit too much. 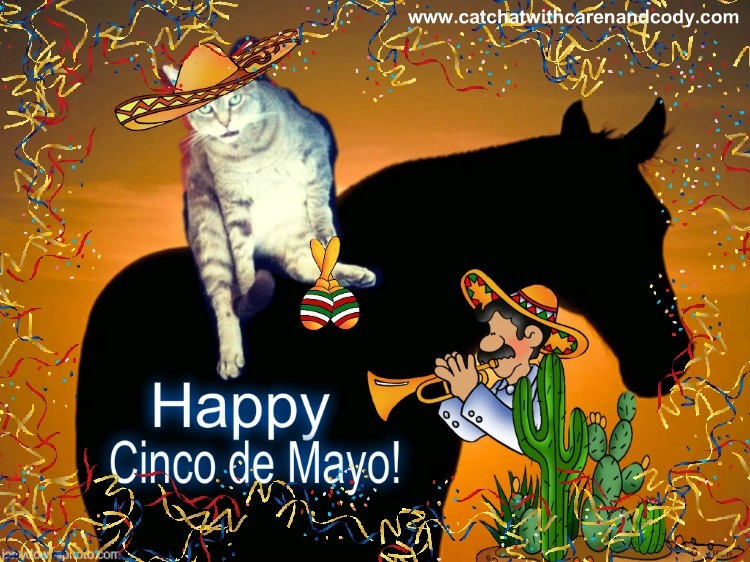 Happy Cinco de Mayo, Cody and Caren! Wishing you lots of fun and festivities! Cute! Happy Cinco de Mayo! I think this picture should be titled "Too-Much-Tequila Cat"...but of course cats shouldn't have tequila. Happy Cinco de Mayo! Cody, you ride horses? Who knew...? And yet the folks in Mexico don't celebrate this day as they do here. Why is that? I don't know either. Looking mighty good on that horse Cody. A very Happy Cinco de Mayo to all of you too. Have a great day. Meowgarita for every furry today!!!!!! Happy Cinco de Mayo! Have a great day! You look adorable Cody. Have a great day. Cody, you look so festive! Happy Cinco de Mayo! That is the coolest photo Cody! Hold the Mayo pal!!! Cody, you look festive ! You look fantastic with your sombrero Cody..
Now I have a hankerin' for some tacos. But, all I have is kibble. Stupid kibble.